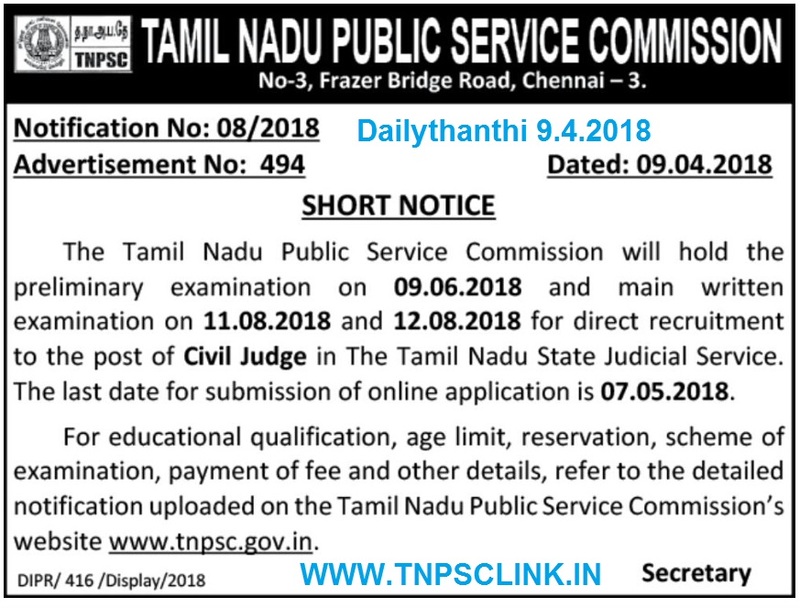 TNPSC Recruitment 2018, 320 Vacancies Civil Judge posts notification published on 9.4.2018, under Tamil Nadu State Judicial Service for Law candidates, eligible can apply through Online Mode on or before 7th May 2018. 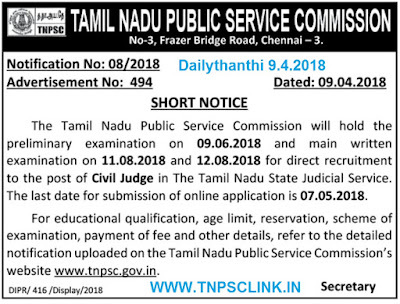 Tamil Nadu Public Service Commission (TNPSC) Invited Online application for the Post of Civil Judge in the Tamil Nadu Judicial Service, candidates are advised to apply their civil judge online application through TNPSC official Website. The last date to apply online for Civil Judge is 07.05.2018, the civil judge post preliminary exam on 09.06.2018, the civil judge main written exam will be held on 11.08.2018 and 12.08.2018. The Civil Judge post Educational qualification, Civil Judge post age limit, Civil Judge post reservation, Civil Judge post scheme of examination, Civil Judge post payment of online fee, Civil Judge post eligibility, Civil Judge post post vacancy, Civil Judge post no of post details will be updated soon. The vacancies have been arrived as 320 approximately, by taking into account the guidelines given by the Hon’ble Supreme Court in Malik Mazhar Sultan vs. U.P. Public Service Commission [2008(17) SCC 703], for the cadre of Civil Judges, in the Pay Scale of Rs. 27,700-770-33,090-920- 40,450-1080-44,770 + Allowances, as admissible under the Rules. The TNPSC Civil judge post preliminary exam on - 09.06.2018 - 10.00 A.M. to 12.00 Noon. The TNPSC Civil judge main written exam will be held on - 11.08.2018 and 12.08.2018. 11.08.2018 09.00 A.M. to 12.00 Noon. 12.08.2018 09.00 A.M. to 12.00 Noon. (b) 50% Marks in case of Open Category (i.e Others). (iv) Must have obtained the Bachelor’s Degree of Law within a period of three years prior to the date of notification. The candidates for admission to Main Examination will be shortlisted as decided by the Commission at a ratio not exceeding 10 times of the number of vacancies following the rule of reservation. Candidates for Viva Voce Test will be shortlisted in the ratio of 1:2 or 1:3 with reference to the number of vacancies as specified in “Instructions to Applicants” under the heading “Procedure of Selection”. The preliminary examination will consist of one paper of objective type based on the syllabus given below containing 100 multiple choice questions (both in Tamil and English), each carrying one mark. Maximum marks will be 100 and ‘1/2’ (half) mark will be deducted for each incorrect answer. The duration of the Preliminary examination will be two hours. The preliminary examination is conducted for the purpose of short listing the candidates and the marks obtained in the preliminary examination shall not be counted for determining the final order of merit of the candidates. No candidate who has secured less than the minimum marks specified for the Preliminary Examination shall be eligible for Main Examination. The Protection of Children from Sexual Offences Act, 2012). The object of viva-voce test is to assess the suitability of the candidate for the cadre by judging the mental alertness, general knowledge, knowledge of law, grasp of procedural laws and principles of law, clear and logical exposition, balance of judgment, skills, attitude, ethics, power of assimilation, power of communication, character, suitability and intellectual depth, the like of the candidate, his/her tact and ability to handle various situations in the Court. Candidates of all categories who have obtained a minimum of 18 marks in the viva-voce test alone are eligible for inclusion in the Select List. The marks secured by a candidate in the Viva Voce Test shall be added to the total marks secured by him/her in the Main examination.